With growing conern among business and homeowners for a better level of security, Pre-lock Security understands that security solutions involve many different layers of protection to reduce being a victum and provide a homeowner something that will really protect them from intrusion and not just another solutoin that only provides peace of mind. Pre-Lock Security Services offers custom made complete door enclouses that look great and provide physical security solutions that will make sure your front door is not going to be kicked in anytime soon. Visual security acts as a huge deterrent, its extremely hard to tactle a break in when you have to spend time trying to figure out how to touch the front door let alone open it. Our custom door and window guards are available in many different configurations and truly look good on your home or business. Our windows door screens are made in Canada from carbon steel in any colour, style, and can be designed to provide your home with security you truly can't get from a standard door system. Durability & ultimate security are our highest priorities. Metalex doors are constructed with extra-strong hardened steel and are guaranteed to last a lifetime, with your choice of stainless steel or brass super-strong locks and hinges. Bring fresh air, light and a new-found sense of space into your home. 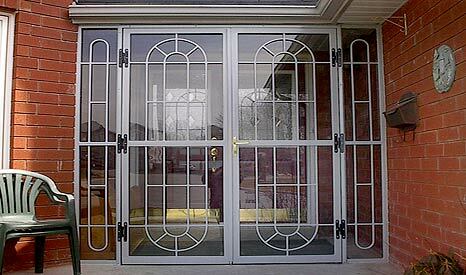 Feel completely safe knowing that our doors will secure your home; day and night. Thousands of delighted Canadian homeowners have valued our design advice, free estimates, and home security assessments. We always look forward to your questions and feedback. Save energy by ventilating your home the natural way; day or night. Turn off that energy-hungry air conditioner & all those extra lights; feel good about making a difference and reducing your impact on the environment - 'every kilowatt counts'. Pre-Lock Screens products are so secure, that the product is endorsed by the Toronto Police Crime Prevention Dept. as well as the Neighbourhood Watch program. Call us today to order you "Real Security Under Lock & Key"
Visit our Toronto show room today.